The following factors are considered when determining the correct status. They follow the principles used in determining actual employment status, but here are applied to determine whether an individual will be a “deemed employee” for tax purposes. A service provider can be treated as a deemed employee if they are obliged to provide their own work and skills. If the service provider is completely free (has the right) to subcontract the work to another party of entirely their own choosing and pay the other person from their own pocket then that the service provider may not be treated as a deemed employee. However, the absence of the right to provide a substitute in their absence does not necessarily mean that the service provider is a deemed employee. This is not necessarily the same as supervision. The University may have the right to exert control over a service provider but in reality little real supervision may take place. Does the right to control the service provider exist in any of the four following areas? The more control that exists the more likely it is that this person is a deemed University employee. In the case of experts it may be difficult to state that the University has control over someone where there is no question of the University being able to tell the expert how to do their job. In these cases the right of control may not be relevant and the rest of the circumstances should be considered when making a decision about the service provider’s status. If a service provider has to incur necessary, significant, financial risk in order to perform their duties then the service provider is less likely to be a deemed employee. An example of this could be if the service provider undertakes work for a fixed price (rather than a price for the amount of time spent) and it is not absolutely certain how long the work will take. An example of this would be if the service provider has quoted £10,000 on the expectation that it will take 2 weeks to complete the task but it actually takes 3 weeks (costing the individual £12,000) the University still pays £10,000. Another measure of financial risk stems from the provision of major equipment. 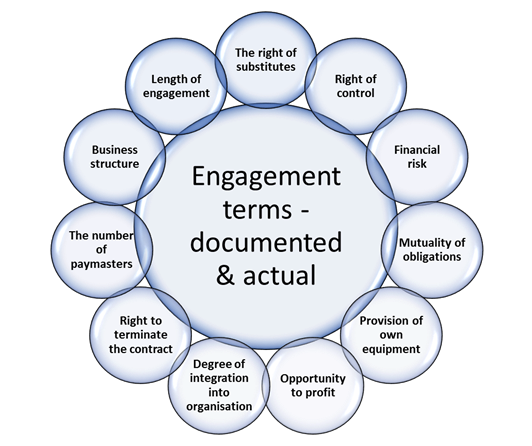 If a service provider is required to and does in practice, provide major pieces of equipment which are fundamental requirements of their duties, then financial risk arises from acquisition, maintenance and replacement of the equipment. This does not include any small tools that a worker may normally provide for themselves e.g. tradesmen who often provide their own hand tools (usually through preference). Laptops would not normally be considered as major pieces of equipment. Again, each of these types of cases should really be viewed on its own merits. Mutuality of obligation implies an employment relationship where an engager is under an obligation to provide work and the worker is under a similar obligation to accept and perform the work which was provided. On the other hand, if a worker is not a deemed employee, he/she has no guarantee for work to be provided and even if work is offered the service provider is under no legal obligation to accept the work offered. The indication of any mutual obligation is usually evident in any service contract between the parties. When HMRC considers whether a service provider is a deemed employee, they will look at who provides the tools for the job contracted. Normally, an employer is responsible for providing equipment to their employees. An employer will provide the facilities and equipment: computer, a microscope, stationery, etc. required for an employee to do their job. A self-employed service provider will normally be responsible for providing their own tools and equipment to enable him/her to undertake the work offered. A service provider who is self employed tends to organise his/her own work as effectively as possible to reduce his/her overheads to increase the profit. This individual is usually paid for the job, quotes a fixed fee and he/she may well be able to complete the job ahead of schedule or at a lower cost than originally envisaged. An employee is usually paid a fixed salary or wage on a regular payment date or for a regular period regardless of performance targets. Another important indicator to consider in relation to deemed employment status is to establish whether a service provider is a ‘part and parcel’ of the engager’s organisation. The greater an individual’s integration within the organisation, the more likely the worker will be a deemed employee of that organisation. For example, an employee will normally have his / her own desk, a designated computer, an organisation’s e-mail address, a land line phone number, his / her own stationary, he/she may wear organisation’s uniform, drive a company vehicle, carry a company business card, and represent the organisation in the meetings, seminars or conferences. Also an employee has access to facilities such as the staff cafe, and access to the employer's premises (often by means of the security pass), and will be allowed to join company pension schemes, receive invitations to staff functions such as Christmas parties and perhaps have a car parking space. In contrast a self-employed individual will not be as integrated into an engager’s organisation, will not have a desk or a computer or access to the organisation’s premises without prior appointment and will not have the “employee type” benefits such as those described above. An employee usually has a right to give a specified period of notice in order to terminate his/her contract of employment. On the other hand a contract for the service provider who is not an employee will usually end on the completion of the particular task. An employee usually has only one paymaster, while a service provider who is not an employee typically performs services for several different businesses, and so tends to get payments from more than one organisation. Is the service provider registered for VAT? Do they operate a business bank account? Do they have the expense of running an office? Do they advertise for work? E.g. do they have an internet site and do they in practice provide (substantial) services to other clients? Whilst a ‘yes’ to any of the above questions alone could not determine a service provider’s status, the answers would help to form an overall picture. When a service provider performs duties on a strictly one-off basis and the relationship between the service provider and the University is very short, it may be appropriate to treat them as not deemed employees. In the case of a visiting lecturer who is only committed to three days or less in three consecutive months, then on that basis alone for those duties only it may be possible to pay the individual gross, but payment should still be through the University Payment System. If you are engaging someone to provide services personally either directly or through a company, partnership or agency then please fill in the online FD3 form giving as much information as possible and forward this form to the Tax Team. You will be given a unique reference number and a clearan­­­­­­ce number if self-employment is agreed. If a decision is not clear the tax team will help you to assess the circumstances and will forward the case details to the HMRC for a ruling. Queries regarding employment status should be directed to the Tax Team and not to Payroll until further notice. To discuss whether the person can be taken on as a temporary or permanent member of staff, or a worker, paid through the UPS.